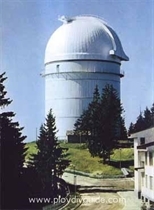 The national astronomic observatory in Rozhen is the largest active astro-physics scientific complex in the Southeastern Europe. It was open on March 13th, 1981, and is one of the two most modern observatories for optical survey and research of the BG Academy of Sciences (the other one being the astronomic observatory in the town of Belogradchik). The Rozhen Observatory is located at an altitude of 1750 m, on the Rozhen peak in the Rhodope Mountains, some 25 km from the town of <?xml:namespace prefix = st1 ns = "urn:schemas-microsoft-com:office:smarttags" />Smolyan.